What Is a Flaring Tool? Flaring tools are adaptive mechanisms used in pipe fittings. They accept pliable metal piping and expand the ends of pipe sections as needed, so the pipe can fit to the next section. Flaring tools employ very traditional technology, probably dating back to the earliest metalworking. They are important in both professional and hobbyist applications, making pipe fitting possible. These tools don't require much technical prowess; just about anyone can use them. Water tightness is pivotal; flaring tools are rated by their ability to form tight fittings. In automotive uses, flaring tools help mechanics fit brake, fuel, cooling and transmission lines. The basic functionality is the same as non-automotive flaring tools, although the size presets provided by the device are industry-specific. 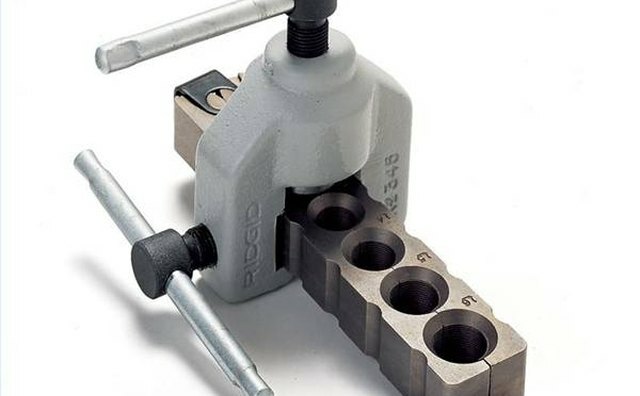 Flaring tools consist of three main components: a metal bar with holed presets that fit different pipe or tube sizes, a screw with a handle that goes into the pipe opening to expand it as needed, and a simple metal piece that fits into the handle and enables rotation by the user. 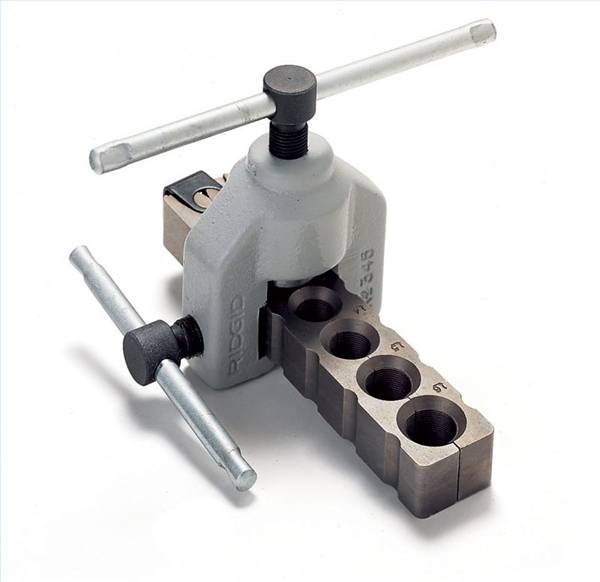 These include block-type flaring tools, as featured in the image above. This form is also known as a screw type. Additionally, single flare tools are cheaper than double flare kits, as the latter provide much thicker and more durable fittings. Flaring tools are also known as cutting tools, because many kits add pipe cutting functionality. It's important to remember all of these tools only work well with soft tubing, mostly copper. They can't adjust harder metals. In automotive uses, fuel and coolant lines often use single flare tools, which are faster and cheaper. However, brake lines universally apply a double flare for safety reasons; they can withstand much greater pressure.